Made from the same top quality rope as the other halters and bridles. This bitless rope bridle features a braided covered noseband. 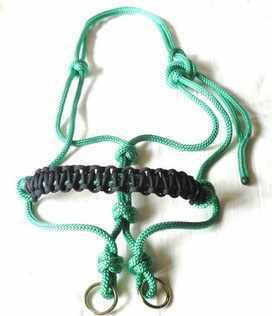 This joins the two ropes of the noseband together and so gives you a noseband similar to that of a bridle. Available in lots of colours for you to mix or match. I am very pleased with the bridle you sent me; the quality and fit are excellent. The pony I bought it for had two habits using a normal head collar. One of stalling at certain gates, applying pressure just did not work. The other was always backing up when putting a head collar on. Using the `easy-does-it` has overcome both these little quirks. He really likes putting the `easy-does-it` on. I would like to order two more for my other ponies.